Crockett Johnson is best known today for his children’s book Harold and the Purple Crayon, first and best of many Harold books, and for other books for children. But his greatest creation is the Barnaby comic strip, which began in 1942 to much critical acclaim, both from intellectuals and from the reading public. A typical reaction was Dorothy Parker’s: “The most important addition to American arts and letters in Lord knows how many years.” Barnaby is not forgotten. The most recent science fiction book I read (by Spider Robinson) has a reference to Barnaby. The daily strip ran from 20 APR 1942 to 2 FEB 1952, but the later dailies and the short lived Sunday (circa 1947, retelling the early dailies) were not by Johnson. Jack Morley took over the dailies in 1946 and drew the Sundays, with Ted Perro adapting Crockett Johnson’s early stories. Crockett Johnson returned to write and draw the last story, 1 JAN 52 to 2 FEB 52. The daily was revived 24 OCT 60 to 14 APR 62, also retelling early stories, redrawn by Warren Sattler. The early Barnaby stories, except those with World War II themes such as rationing and civil defense, have now been told five times: in the original daily, then in three issues of a digest magazine, Barnaby Quarterly, then in two hardback books, then in the Sunday (this time not by Johnson), and finally in the revived daily. Of these many tellings, the two hardbacks, for which the strips were entirely redrawn, are the best. Barnaby was one of the few comic strips to actually have an ending, and Crockett Johnson returned to the strip to write and draw that last story in 1952. I remember it well (I was ten years old at the time). This ending has only been reprinted in the pages of Comics Revue. 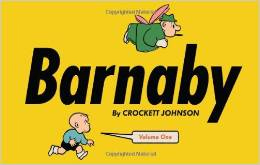 The original Barnaby comic strip is being reprinted by Fantagraphics Books. Volume One reprints daily strips from 1942 and 1943. Here is an episode guide to the Crockett Johnson Barnaby stories, and to reprints in the Quarterly, in Books, in Paperbacks, in the Sunday, and in the 1960's. These paperbacks reprint the dailies through 31 MAY 1946. Johnson left the strip a few months earlier..